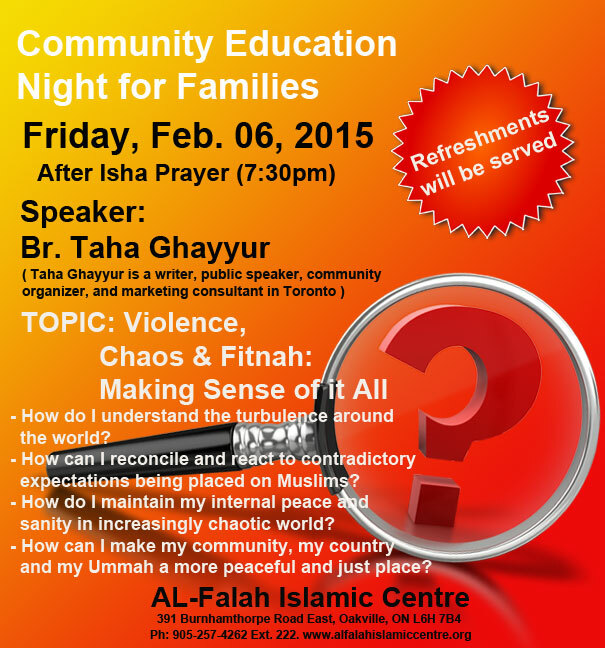 Al-Falah Islamic Centre is inviting you to attend Community Education Night for Families, on Friday Feb. 6th after Isha Prayer at Al-Falah Islamic Centre. – How do I understand the turbulence around the world? – How can I reconcile and react to contradictory expectations being placed on Muslims? – How do I maintain my internal peace and sanity in increasingly chaotic world? – How can I make my community, my country and my Ummah a more peaceful and just place? 1- Isha Prayer (Jama’at) at Al-Falah Islamic Centre will be at 7:30 PM. 2- Br. Taha Ghayyur will start his presentation immediately after Isha Prayer, followed by Q & A session. 3- Refreshments will be served.